The potential of a corroding metal, often termed Ecorr, is probably the single most useful variable measured in corrosion studies as well as during the corrosion monitoring of complex field situations. It is readily measured by determining the voltage difference between a metal immersed in a given environment and an appropriate reference electrode. Note that in Figure 4.5 the reference electrode is contained in a Luggin capillary to prevent any contamination of the reference electrode by the environment or the opposite, i.e. leaking some corrosive agent in the environment being monitored, while making potential measurements very close to the surface of the metal being monitored. What is the principle of a Luggin capillary and what are the main functions of such a device? In measuring and reporting corrosion potentials, it is necessary to indicate the magnitude of the voltage and its sign. In the example shown in Figure 4.5, the corrosion potential of metal M is -0.405 V. The minus sign indicates that the metal is negative with respect to the reference electrode. 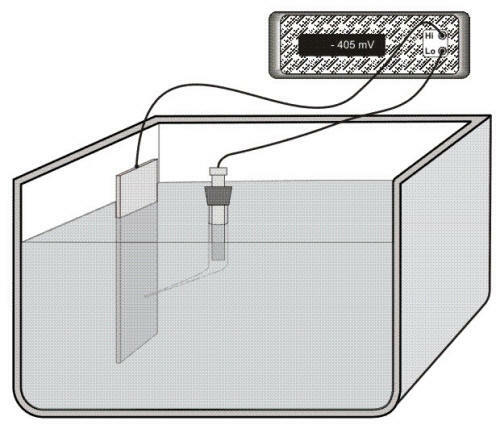 However, if the metal was connected to the low point (Lo) and the reference electrode to the high point (Hi) the reading would be +0.405 V. It is customary to connect the reference electrode to the low point or the instrumental ground to avoid any confusion in reporting. Nonetheless, some manufacturers of electrochemical equipment have done the opposite.